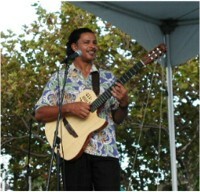 Randy Lambert has been considered one of Bermuda’s best musician and entertainers for most of his adult life. A master guitarist, with the reputation of being Bermuda’s own “Jimi Hendrix”, Randy’s style and electrifying presence on stage has kept him on the cutting edge in the entertainment scene in Bermuda for many years. A songwriter as well as a prolific interpreter of the great standards and top hits from the bebop and swing era right up to today’s chartbusters, Randy is currently developing a “pop island” sound with his band TEMPO. He formed TEMPO in 1991 to dedicate himself to his music on a full time basis. Randy’s career has taken him to Canada and the USA. He has opened for many international stars including The Drifters, Sonny Turner of the Platters, Maxine Brown, The Commodore’s, Third World, Peaches & Herb and Randy & TEMPO were privileged to be one of the Bermuda bands to open for JazzScape ’96 which was headlined by George Benson and Gladys Knight. The band also had the opportunity to perform with Herbie Mann during the JazzScape ’96 activities. TEMPO was honored once again by being selected to perform in JazzScape ‘ 97.